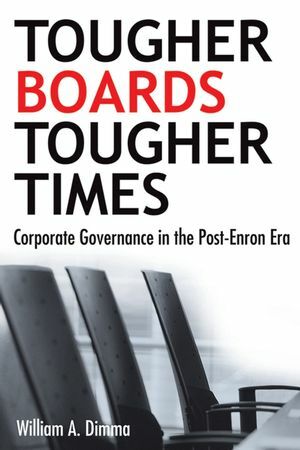 "Written by one of Canada’s leading and most experienced directors, Tougher Boards for Tougher Times is a must-read for all aspiring, current and seasoned directors. This eye-opening book inspires all of us to strive for excellence and integrity in the boardroom in an intelligent, informative and pragmatic way." "The ‘tick the box’ requirements of good governance are now well understood and broadly followed. These are the basic foundations for good governance. Dimma makes a real contribution to moving from that base to the new level of governance performance required in today’s corporate environment, drawing on practical experience and relevant examples of how governance can be improved." "Bill Dimma uses a light touch in bringing to bear all the wisdom of his vast boardroom experience. He shows that it’s not just what you do as a director, it is also the way that you do it that matters in the post-Enron boardroom world." "If all corporate directors had carried out their responsibilities as capably as Bill Dimma, corporate governance would not be such a controversial issue as it is today. This is a ‘must read’ for directors as well as our future business leaders—the business students of today. It is an opportunity for all of us to learn from a pro!" "In the world of corporate governance three things matter most: experience, experience, and experience. Bill Dimma is the voice of experience. His latest book cuts through all the theories and fads in the corporate governance craze and offers truly useful advice." William A. Dimma has had a long and distinguished career as a director, serving on fifty-five corporate boards and another forty not-for-profit boards. For over forty years, he has been sought after for the knowledge and understanding he brings to the field of corporate governance, as well as for his dedication to, and passion for, improving the practice of directorship. Mr. Dimma has served as a director or chairman for the following organizations, among many others: Brookfield Asset Management Inc., Delta Hotels, Enbridge Inc., Greater Toronto Airports Authority, Home Capital Group, London Life Insurance Company, Monsanto Canada, Sears Canada, Torstar Corporation, Trizec Corporation, and Union Carbide Canada Limited. In addition to his illustrious career as a director, Mr. Dimma has also held numerous senior management positions at companies such as Union Carbide Canada, Torstar Corporation and Toronto Star Newspapers, A. E. LePage, and Royal LePage. He earned a doctorate in Business Administration from Harvard University and holds honorary degrees from several Canadian universities, as well as the Order of Canada and the Order of Ontario. The Institute of Corporate Directors (ICD) is the national association for corporate directors in Canada. Their membership represents directors who serve corporations of all sizes, including not-for-profits, SMEs (small and medium sized enterprises) and crown corporations. The mission of the Institute of Corporate Directors is to represent the interests of directors -- to foster excellence in directors to strengthen the governance and performance of Canadian corporations. The ICD will achieve this mission through education, certification and advocacy of best practices in governance.